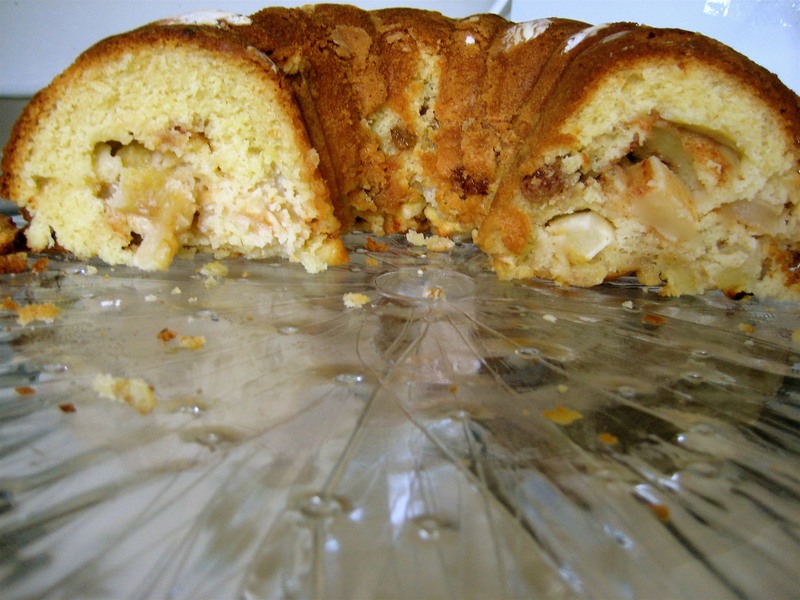 Jewish Apple Cake – Voila! To continue with the brunch theme…we turn to a recipe from my mama. It’s fitting to eat apple cake (with cinnamon and raisins mixed in) around Rosh Hashana and Yom Kippur — the two most important Jewish holidays of the year — because it’s the beginning of the Jewish New Year! Traditionally, Jews celebrate by eating apples and honey to welcome in a sweet new year. So back to brunch! Brunch offers opportunities galore when it comes to deciding what to make. So earlier this week we took the apple cake out of its usual place in the calendar year and ate it in July! grease/flour bundt pan. preheat oven to 350. 1. After slicing and chunking apples, sprinkle with lemon juice and set aside. 2. Mix 4 T. sugar, cinnamon, raisins in small bowl. Set aside. 3. In large bowl, beat eggs. Add 2 cups sugar and mix until creamy. Then add canola/vegetable oil. 4. In separate medium bowl, combine sifted flour, salt and baking powder. Slowly add to egg mixture. 5. Add orange juice and mix completely. Add vanilla extract and stir until smooth and everything is mixed! 6. Pour 1/4 batter into bunt pan. Add 1/3 of the apples. then sprinkle 13 of cinnamon-raisin mix. Repeat steps, ending with the batter on top! 7. Bake for 50-70 minutes — although check around 45 minutes, just to test where the cake is. Voila! you’re ready to eat! Post-baking thoughts: Other suggestions written on the original recipe is to serve it with vanilla ice cream and/or caramel sauce. Often we;d cut ourselves a slice — without heating it up or ice cream — and it was still fantastic. Pingback: L’Shana Tova! It’s Rosh Hashanah « Voila!